When I was still working a forty-plus hour week, I had little time to examine my lifestyle for healthy activity. But each day I made sure to spend some quiet time, walk on my treadmill and then I was on my feet all day in my classroom. But, after I retired I found I needed to be a bit more proactive in including all the elements of a healthy lifestyle. I am free to sleep in a bit and can take a break any time I want. I’m enjoying retirement very much, but still, I want to be sure I’m getting enough exercise, eating properly and staying connected with friends. Here are some tips for building a healthy lifestyle after sixty. Work to maintain healthy eating habits. Those include eating regular meals to ensure a normal metabolism and refrain on loading up on fats and sweets when becoming overly hungry. It also means eating a high fiber diet, one high in whole grains, beans, fruits and vegetables. As we age we need to eat fewer calories and less fat. We also need to be sure we get enough calcium and Vitamin D in either dairy or soy products or via supplements. When you snack, be smart. Keep healthy snacks on hand such as dried fruit, peanut butter or nuts and whole grain crackers and cheese. Drink plenty of water. Use a water bottle with ounces marked on the side to track your intake for the day. In general, most adults benefit from drinking eight glasses of water per day. First, be sure you’re getting adequate sleep. Most older adults need from seven to eight hours of sleep each night. Then, take a look at all aspects of your life to see where you’re getting much-needed exercise. Yard work and housework both require moderate amounts of exercise. That counts. A daily walk of about thirty minutes is a great idea. Put some fun into your exercise by playing tennis, taking a dance class, doing water aerobics or some other form of group exercise. Work specifically on exercises that help maintain balance and flexibility as these decrease as we age. Check out your neighborhood for exercise opportunities such as gyms, tennis clubs, senior centers and community centers. Avoid depression and loneliness by finding ways to connect with others. Volunteer in the community, find a walking partner, join a club or visit your local senior center to see all the activities offered. 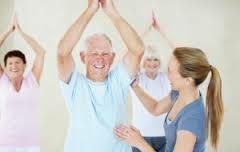 Most senior centers have a variety of fun classes, games, and activities available. Invite others to your home to eat meals together or go out to eat with friends. Attend church and church-related activities. Join a book club or find a new hobby that takes you to meetings and fun gatherings. Public places such as libraries are great places to search out the offerings in your local community. Maintaining our healthy lifestyle is more than just what we eat. It’s about our total well-being. Be proactive in balancing your days so you’re as active as you want to be. And don’t forget that giving back to your community is a wonderful way to stay involved and enjoy a full, satisfying life.